A true working farm, this 80 acre paradise in the beautiful Texas Hill Country offers delights for the young and old alike. Start your day with homemade breads or muffins being delivered to your door and then the farm is yours to explore. A stay at Majestic Oaks is an experience unlike the normal destination. A true working farm, this 80 acre paradise in the beautiful Texas Hill Country offers delights for the young and old alike. The 28 miniature horses on the farm are graceful and lovely to see and they enjoy interacting with the guests who are invited to pet them to their hearts' content. The owners of course grow and harvest hay on the land for these beauties and the vegetable gardens adjacent to the Cottage and Old House are truly a wonder to see. After a hike or a stroll around the property, a swim in the pool is a great way to relax. The owner's home, the Cottage and Old House all look out onto the pool which is surrounded by pots of blooming flowers. The Cottage and Old House have all the conveniences of home with fully equipped kitchens, a jar of homemade cookies, satellite TVs with DVD, Wi-Fi internet access, a charcoal grill, lovely bed and bath linens and ample window units for A/C and heat. Treat your family to a stay at this little piece of heaven. Standard Cancellation Policy: By making a reservation you agree that we will charge $25 for any cancellation more than 10 days from your arrival date. Within 10 days of your arrival date, you agree that you are responsible for the first night's full rate. You are responsible for the entire booking if you have not cancelled your reservation prior to your arrival date. There is no refund for early checkout. If we rebooks the reservation, there will only be a $25 cancellation fee. Cancellation Policy Event or Holiday Weekends: By making a reservation you agree that we will charge $25 for any cancellation more than 14 days from your arrival date. Within 14 days of your arrival date, you agree that you are responsible for the first night's full rate. You are responsible for the entire booking if you have not cancelled your reservation prior to your arrival date. There is no refund for early checkout. If we rebooks the reservation, there will only be a $25 cancellation fee. Great place. Extremely clean and neat. Well furnished. The only negative thing for us was it was too far from Bandera. Serene, beautiful, relaxing and simply charming! Felt like home away from home! This serene rural setting amongst the birds and breezes was the perfect escape from the hecticness of everyday life. The hosts were exceptionally hospitable and the cottage was as charming and immaculate as could be. Delicious homemade breakfast just topped it all off! 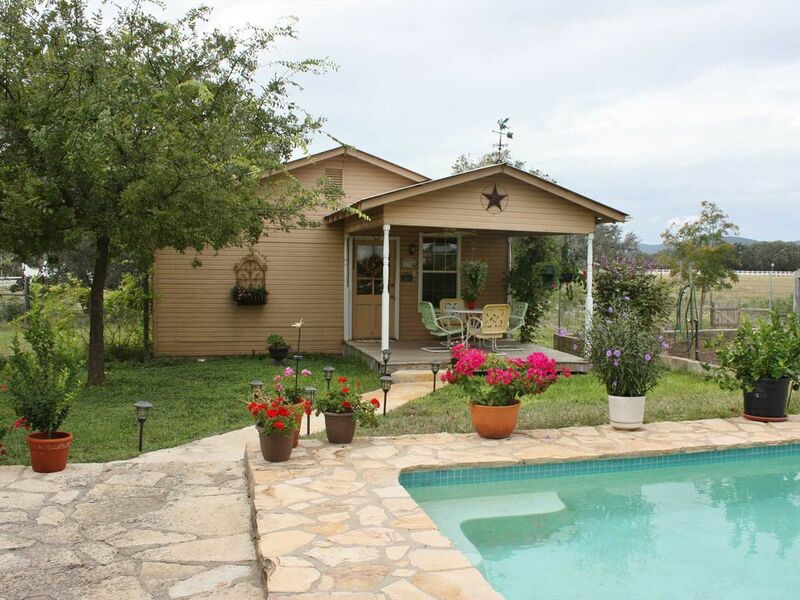 This is the perfect home base location for exploring many places in the hill country, or for just relaxing on the farm or in the pool away from it all. We can’t wait to return and share another weekend with the rest of our family! It felt like home away from home!